The hoodie part would be referring to Facebook CEO and co-founder Mark Zuckerberg, who topped the list — which is in the just-released October issue — for the second year in a row. The Vanity Fair list was packed with Silicon Valley luminaries. The No. 2 spot went to the hopelessly conjoined twins at Google, CEO Larry Page and his co-founder Sergey Brin. Amazon’s Jeff Bezos was No. 3, followed by newly born CEO Tim Cook and top product guy Jonathan Ive of Apple at No. 4, with Twitter creator and Square founder Jack Dorsey at No. 5. Interestingly, super-VCs Mark Andreessen and Ben Horowitz clocked in this year at No. 6. The digitally fast-forward Lady Gaga was the top woman on the list at No. 9, in front of “Harry Potter” author J. K. Rowling at No. 16. That actually is pretty accurate. More importantly, we were ranked higher than Justin Timberlake and Ashton Kutcher. In other words: Mission accomplished! We also beat the Angry Birds dudes at No. 49, whom my two kids would nonetheless have voted tops over their mom any day of the week and twice on Sunday. “These are the people who have shaped the world we live in today — and continue to wield enormous influence,” said Vanity Fair, which translates into dustier moguls. Topping the powers-that-be, of course, is Apple’s co-founder and Chairman Steve Jobs. And outgone Google CEO and now Executive Chairman Eric Schmidt is now enshrined in the hall of fame. NEW YORK, N.Y. — “The Age of Information gives way to a burgeoning Age of Technology,” announces Graydon Carter, remarking on the “seismic shift in interest and influence” that has occurred in the 17 years that Vanity Fair has been ranking America’s power players. 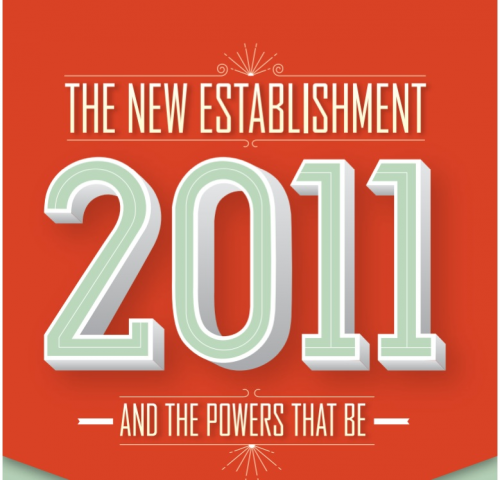 The magazine’s 2011 New Establishment list identifies the top 50 of an innovative new breed of buccaneering visionaries, engineering prodigies, and entrepreneurs, who quite often sport hoodies, floppy hair, and backpacks. Mark Zuckerberg, founder of the inescapable social-networking site Facebook, maintains his perch at the top of Vanity Fair’s 17th annual New Establishment List ranking for the second year in a row. With a possible I.P.O. on the horizon by 2012, which could value the company anywhere between $50 and $100 billion, Facebook has enough clout to worry even the unshakable Google. Zuckerberg is still the youngest person ever to top the list. Sergey Brin and Larry Page, co-founders of Google, are in the No. 2 spot this year, closing in on Zuckerberg as they jump up one spot, from No. 3 in 2010. Eric Schmidt, who appeared on the list last year with the duo, has since been pushed out of the C.E.O’s office, replaced by Page. Despite reports of an anti-trust investigation, Google has been setting its sites on Facebook by concentrating on strategic initiatives, such as engineering social-networking features. Lady Gaga makes an appearance for the second year in a row. Coming in at No. 9, she is the highest-ranking woman on the list, in front of J. K. Rowling at No. 16, Sheryl Sandberg, of Facebook, at No. 26, Angela Ahrendts with Christopher Bailey, of Burberry, at No. 30, Natalie Massenet at No. 32, and Kara Swisher with Walt Mossberg at No. 40. At 25 years old, Gaga is also the youngest person on the list — not a surprise for someone whose fans managed to crash Amazon’s servers in their desperation to download her third album. The New Establishment, Vanity Fair’s annual ranking of the top leaders of our time, is made up of owners, creators, buyers, thinkers, and innovators — the movers and shakers in the worlds of technology, media, business, politics, entertainment, and fashion. These men and women are the taste-makers and trendsetters, opinion formers and agenda creators, not to mention empire builders. Entry into the ranks of Vanity Fair’s list is based on a number of factors: wealth, influence, and philanthropy, as well as such intangibles as vision and the x factor. The October issue of Vanity Fair will be on newsstands in New York and L.A. on September 1, and nationally and on the iPad September 6. NEW YORK, N.Y. — This year Vanity Fair inaugurates a list of the Powers That Be. These are the people who have shaped the world we live in today — and continue to wield enormous influence. Many are longtime New Establishment members, and their destinies are intertwined with the members of this year’s New Establishment. Steve Jobs, of Apple, holds the top spot on the list of the Powers That Be. Since Jobs took control of the company 14 years ago, the stock’s share price has risen more than 6,500 percent. At the height of the debt crisis in late July, Apple had more cash on hand than the U.S. government. Bernard Arnault, of luxury-goods company LVMH, ranks in the No. 2 spot. As an overseer of countless enduring luxury brands, Arnault has left his mark on the industry. Last year he spent $2 billion to accumulate a 20 percent stake in family-controlled but publicly traded Hermès. Mayor Michael Bloomberg is No.3 on this year’s list while News Corporation chairman Rupert Murdoch comes in at No. 4. The tumultuous News of the World scandals this year have shaken the media baron, but also shown his staying power in the face of just about anything. Brian Roberts and Steve Burke, of Comcast, NBCUniversal, who recently acquired the U.S. media rights to the Olympic Games through 2020, are No. 5. Jill Abramson is the highest-ranking woman out of six on the list, at No. 9. She is followed by Angelina Jolie with Brad Pitt at No. 11, Sue Naegle with Richard Plepler and Michael Lombardo at No. 15, Anne Sweeney with George Bodenheimer at No. 22, Bonnie Hammer at No. 24, and Arianna Huffington with Tim Armstrong at No. 25. Because some power is permanent, Vanity Fair nominates a number of regulars to the Hall of Fame this year. Warren Buffett, of Berkshire Hathaway, joins Barry Diller and Diane von Furstenberg, Tom Ford, actor Tom Hanks, and designer Karl Lagerfeld. Network impresario Oprah Winfrey, Jeffrey Katzenberg, of DreamWorks Animation, and talk-show host Charlie Rose all make the ranks as well.